Who's the fastest master on the chessboard? We'll find out in April as Chess.com hosts the Bullet Chess Championship, and all titled players have a chance to qualify for the event. All titled players are invited to participate in the two Bullet Chess Championship Swiss qualifiers, running on April 3 and 4 at 12 p.m. PT. Both qualifiers will be broadcast live on www.Twitch.tv/Chess. 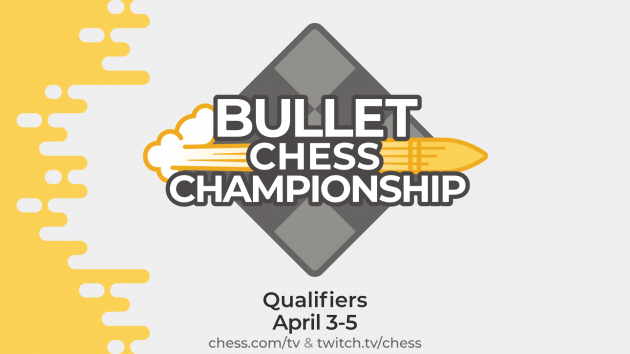 The total prize pool for the Swiss qualifiers is $2,000 ($1,000 each), with the winners of each qualifier gaining entry to the Bullet Chess Championship bracket, where they will square off against some of the top bullet players in the world. The Bullet Chess Championship bracket will be played April 6-7 with $11,150 in prizes. Players who participate in the Swiss qualifiers will have a higher likelihood of being invited to participate in the round-robin qualifier, so be sure to play in both Swiss qualifiers to increase your chances of qualification and prizes. Hikaru Nakamura—Chess.com #1 bullet player at time of invitation. Maxime Vachier-Lagrave—World #2 blitz (FIDE) at time of invitation. Alexander Grischuk—Three-time world blitz champion. Levon Aronian—World #4 blitz (FIDE) at time of invitation. Sergey Karjakin — 2016 World Blitz Champion. Matchups and pairings are based on FIDE standard ratings as of March. All games are 1/0 (one minute per game with no increment). April 3, 12 p.m. PT: Swiss qualifier (25 rounds). Winner through to championship bracket, places 2-4 to round-robin qualifier. April 4, 12 p.m. PT: Swiss qualifier (25 rounds). Winner through to championship bracket, places 2-4 to round-robin qualifier. April 5, 10 a.m. PT: Round-robin qualifier (10 players, each player plays every other player twice as White, twice as Black). Winner through to the championship bracket. April 6, 10 a.m. PT: Championship bracket (eight players) quarterfinals and semifinals, 60 minutes of 1/0 chess per match. April 7, 10 a.m. PT: Championship bracket finals (best of five sets with six games per set) and third-place match (best of three sets with six games per set). 25-round Swiss, tournament paired by Chess.com's live server. Winner earns spot in quarterfinals of the championship bracket. Places 2-4 earn spots in round-robin qualifier. Chess.com tiebreaks used to determine final standings. If a qualifying spot is won in the second qualifier by a player who has already qualified in the first tournament, that player will have their choice of Swiss qualifying seeds in the Bullet Chess Championship bracket. The other qualifying spot will go to the next finisher of the Bullet Chess Championship Swiss Qualifier 2 based on Chess.com live server tiebreaks. Six players selected by 2-4 place finishes from the previous two days of qualifiers. Four wildcards selected and announced by Chess.com following the second qualifier on April 4. All players will play each other four times, rotating colors, with the higher-rated player receiving the white pieces in the first and third games. If two players are tied with the same total score, they will play two-game sudden death matches until one player scores 1.5/2. These mini-matches will start after a brief break following the main round-robin.